Making SA a Great Place to Fish Again. Making South Australia a Great Place to Fish Again; presents a series of strategic initiatives that we believe will improve the quality of fishing for the 277,000 South Australians that fish every year and the many thousands of visitors that come to our great state to dangle a line. These initiatives have been formulated by RecFish SA in response to extensive contact with the states grassroots recreational fishers over many years who are demanding that government recognises the economic, social and wellbeing benefits of the recreational sector by doing more to improve fish stocks and the quality of fishing in SA. 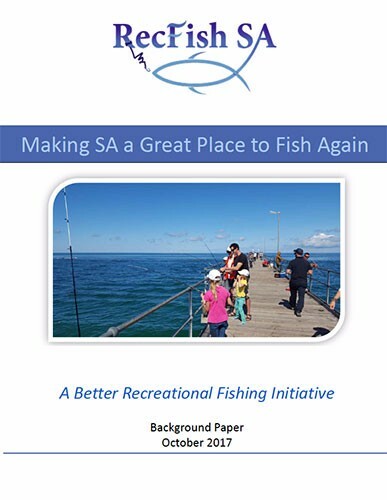 The suite of initiatives presented in this document also align to A Better Future or Recreational Fishing in South Australia; Recreational Fishing Strategic Plan 2014-2018 released by RecFish SA in 2014.